Kamchatka Snow Sheep (it has 2n=52 pairs of chromosomes) is one of the oldest inhabitants of the peninsula. Since ancient times the fine meat of snow sheep was used for food and various household articles were made of its horns. 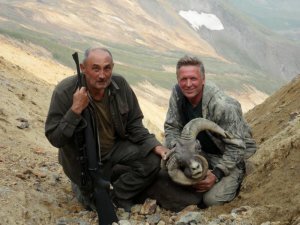 As an object of sport hunting snow sheep became available to foreign hunters starting in 1991, after Kamchatka was opened. Kamchatka Big Horn inhabit the peninsula south below the 60th parallel. To the north of the 60th parallel the population is considered Koryak Snow Sheep. The sheep inhabits the Koryak plateau and north-eastern coastal. The north-west territory is the abode of the Okhotsk Snow Sheep, it is rather complicated to differentiate these subspecies based on the existing scientific materials. There are the suppositions formed by the geographical data of places of inhabitance and some phonological differences. The incredible remoteness of the region makes serious study of the snow sheep difficult. In spring of 2000 the population of Kamchatka snow sheep was recorded at 4500 animals. Many areas such as the Koryak plateau, coastal portions of the Koryak Region and much of the mainland were not surveyed). Annually less than 50 rams are taken on the entire Kamchatka Peninsula. 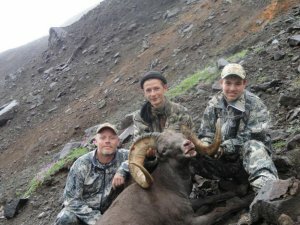 Utgard has marvellous areas for Snow Sheep hunting consisting of mountains in the Eastern and Central ranges. We are planning to organize an expedition for the Okhotsk snow sheep in the future. Utgard holds permits to harvest 7 snow sheep per year. Before your hunting starts our guide will scout the area by horse, and then we will decide where it is best to set up the tent camp. Accommodations in tents are comfortable and designed around making sure your needs are met. All camps also have a separate spacious kitchen/dining tent. Hunting is designed around a 1 to 1 guide to hunter ratio. At times you and your guide may leave the main camp for a few days and hunt from a spike-camp. Sheep hunting starts August 1. 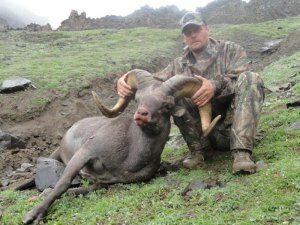 A mature ram weight 80-95 kg (176-210 pounds) with the average length of horns 80 85 cm (31-33 inches). 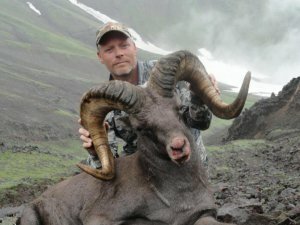 In 2004 our guest's largest trophy taken was an incredible 37 inches, the smallest was 33 inches, both of these rams were 9 years old. 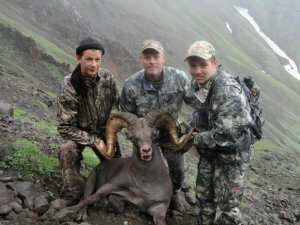 The biggest Kamchatka Big Horn ever taken on the peninsula (45 inches) was taken by a local guide in 1999. In August - September you may see bears during sheep hunting and can combine your hunt. It may rain during this time but seldom will it snow. It is necessary to have high quality waterproof clothing and the proper equipment for your hunt. 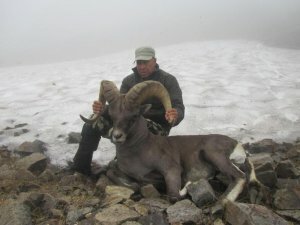 Snow Sheep hunting is physically demanding and your personal experience with mountainous hunting can make a difference in your success.